Yesterday, Russia-backed militants increased the number of attacks in Donetsk and Luhansk sectors twofold and continued using Minsk-proscribed weapons. “In total, Russia-backed militants conducted 33 attacks on Ukrainian positions along the entire frontline. Ukrainian troops returned fire 19 times,” reported Ukrainian Ministry of Defense spokesman on ATO Colonel Andriy Lysenko at a press briefing at Ukraine Crisis Media Center. In Luhansk sector, the enemy committed 15 ceasefire violations. They were the most active on the outskirts of Krymske and Luhanske. “Russian proxies attacked the defenders of Luhanske five times, using mortars twice and firing a total of 22 mortar rounds of various calibers at our troops,” elaborated Col. Lysenko. Ukrainian soldiers responded with fire once using mounted grenade launchers and small arms. Near Krymske, militants attacked Ukrainian strongholds four times using small arms and grenade launchers and opened random fire using 82-mm mortars once. Ukrainian troops returned fire using small arms and automatic grenade launchers. Moreover, Russia-backed militants attacked Ukrainian troops near Katerynivka with 82-mm mortars and mounted grenade launchers twice after dark, firing a total of 13 rounds. Hostile armed provocations were recorded also in Zaitseve, Valuiske, and Novooleksandrivka areas. In Donetsk sector, Russian proxies committed 18 ceasefire violations. They shelled ATO troops with mortars three times. 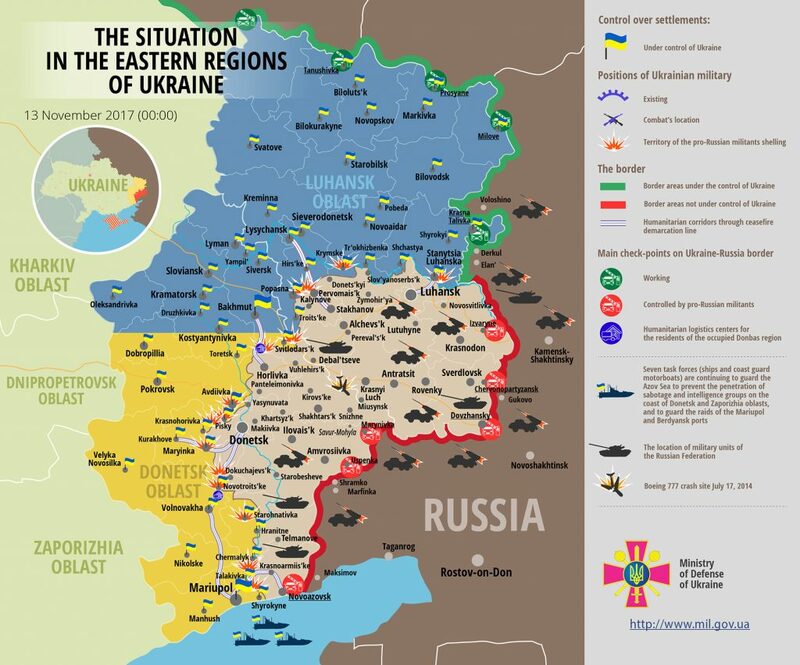 Near Hnutove they fired 41 mortar rounds of various calibers. “Moreover, the enemy fired four 120mm mortar rounds at Ukrainian positions near Vodiane. They used grenade launchers, heavy machine guns, and IFV weapons in the same area during the day. Ukrainian troops opened twice opened aimed fire using mounted grenade launchers, making the enemy seek cover,” said the spokesman. Militants’ activity during the day was also recorded in Avdiivka, Pisky, Nevelske, Pavlopil, Maryinka, Starohnativka, Novotroitske, Novoselivka Druha, Berezove, and Mykolaivka areas. “Our troops mostly returned fire using grenade launchers, IFV weapons, and small arms,” added Col. Lysenko. According to intelligence data, Russian Federation continues to supply the militants with fuel and lubricants, as well as automotive equipment. During the week, Russia-backed militants received two railway trains of fuel and lubricants (14 tanks carrying a total of 841 tones) and a motorcade consisting of 11 vehicles, including communication vehicles, «Ural» trucks, and «GAZ-66» medical vehicles. Fortunately, Ukrainian Armed Forces suffered no casualties yesterday. Report on the military developments as of November 12 is available here. Interactive data on the shelling: chronology shelling chart and the interactive map.